The working conditions of contract academic staff (sessionals) are of both local and national concern, which is why the Canadian Association of University Teachers (CAUT) annually promotes and plays a coordinating role in Fair Employment Week (FEW). This year, FEW runs from October 22 to 26 and is a national event that raises awareness of the difficulties inherent in being a member of the contract academic staff. These academics are often on the front lines of attacks on academic freedom, quality, fair treatment, and the value of research. Normally, sessional instructors at the University of Calgary are contract academics who are hired to teach individual courses; they are not expected to do research and they are not offered long- or short-term commitments beyond the individual courses. These academics often work for lower pay, and with the uncertainty of whether or not another short-term contract will be extended to them. Between 2005 and 2015, there was a 79% increase in university teachers working part-time. 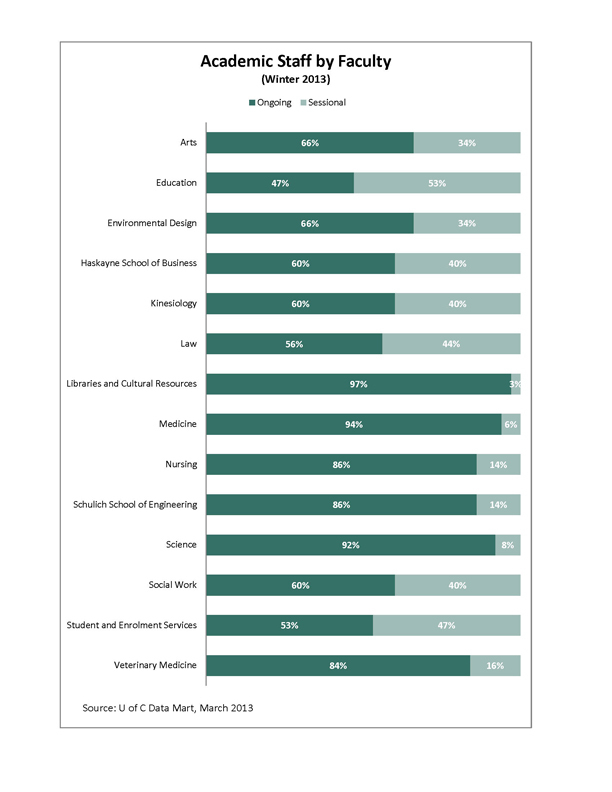 53% of respondents want a tenure-track university or full-time, permanent college job. 69% of survey respondents feel their working conditions need to change. 45% of respondents reported that if they did not get their contract instructor pay, they wouldn’t be able to pay their monthly bills. The Faculty Association at the U of C was not surprised by these results and many of the responses to the survey reflect the anecdotal experiences of sessionals we have been privy to year after year. In March 2018 the Association took a snapshot of academic staff at the U of C which revealed that 22.4% of academic staff at that time held sessional positions. The number of sessional academic appointments are almost equal to the number of Associate Professors. In addition, over half of sessionals are female which is in contrast to statistics for ongoing academics. Sessionals are employed in every corner of the University and some Faculties employ more sessionals than others. In some cases the number of sessional instructors make up a third to over a half of academic staff in a Faculty. It is important to emphasize the incredible dedication of sessional academics to their jobs since they are highly-qualified individuals who care deeply for the University and their students. The Association has always recognized that the concerns of contract academic staff should be the concerns of us all. Please let your colleagues and administrators know that the unfair treatment of sessionals at the U of C needs to be resolved. Fair Employment Week (FEW) takes place this year from October 23 to 27, 2017. Each year the Faculty Association participates in this national event that raises awareness of the difficulties inherent in being a member of the Contract Academic Staff (the primary group at the U of C being sessional academics). Universities continue to lean on Contract Academic Staff as a cheap, flexible workforce. At the U of C sessional instructors are typically hired to teach individual courses; they are not expected to do research and they are not offered long-term or even medium-term commitments beyond the individual courses. These academics often work for low pay, and with the uncertainty of whether or not another short-term contract will be extended to them. Sessional instructors are members of the Faculty Association and voted to join the Association in 1994. Since that time, the Association has consistently worked to negotiate representation rights and protections for sessionals. We believe one strong reason for these gains has been due to the united front the Faculty Association is able to maintain through representing both ongoing and sessional academics. The Association has worked to strike a balance between trying to slow the casualization of academic work while trying to improve the working conditions of those academics while they are in sessional positions. The Collective Agreement states that continuing appointments are to be used to meet the continuing staffing needs of the University whenever reasonably practical (Article 23.1). A copy of the Collective Agreement can be found on our website here. The Faculty Association regularly reviews the use of sessionals in Faculties and departments, paying particular attention to where there are sessionals with substantial teaching loads, who teach year after year. We have been able to work with Faculties to achieve ongoing limited term or in some cases tenure-track appointments for these members, who thereby gain increased job security and access to benefits and a pension, among other things. In this way, and through challenging sessional use generally in Faculties, the Association is working to secure ongoing appointments for as many academics as possible. We do realize that there are situations where sessionals are likely appropriate. A professional who holds specific expertise may be hired for a particular course or there can be situations in which a Faculty requires an instructor to fill a short-term vacancy. The reasons a sessional appointment can be used are outlined in the Collective Agreement under Article 23.2. However, situations in which the bulk of courses that are required for a program are taught year after year by sessionals need to be addressed. In the Collective Agreement we have also worked to improve conditions for sessionals. After a sessional teaches eight (8) half-course equivalents they gain the right of first refusal for courses they apply for, provided they have taught within the last five years and subject to having a good record of performance plus the requisite knowledge, skills and professional qualifications for the position (Article 23.12). Salary rates have also been set as minimums only, so although sessionals must be paid at least the minimum they can also be paid more. Salary rates for sessionals are set up as steps on a salary grid. After a sessional teaches 8 half-course equivalents they are automatically moved up to the next step on the grid. We have also negotiated a professional expense reimbursement fund for sessionals, similar to the one for ongoing academics. Sessionals are eligible for $175 per half-course equivalent up to $1,750 per academic year. Information on salary and benefits for sessional academics can be found in the Collective Agreement under ‘Schedule B’. When negotiating the Collective Agreement, the Faculty Association has traditionally worked to ensure sessional academics receive increases to salary rates which equal or exceed those of ongoing staff. This is done in the spirit of fairness but also with the recognition that sessionals do not have the same job security and benefits that ongoing academics have. The Faculty Association believes that sessional academics should be seen as colleagues, as fellow academic staff members, and as such should be fully supported in their work. The Collective Agreement outlines access to facilities, resources, and participation in department meetings (Article 23.8). Further support is provided by the Faculty Association Sessional Travel Grants to assist these members with making scholarly presentations and participating in other scholarly activity in their field. This type of support is not offered to sessional academics elsewhere. The application for these competitive grants is currently open (and more information can be found here). All of this said, sessionals here and across the country inhabit a very precarious position as these academics work from contract to contract, being paid for piecework with few benefits. The problem of reliance on casual work is not unique to the U of C. According to the Canadian Association of University Teachers (CAUT), contract academics make up approximately one-third of all academic staff in Canada. These academics are paid on average one-third less per course than an ongoing academic staff member or roughly 67 cents on the dollar. The Canadian Association of University Teachers (CAUT) is undertaking a national study on the experiences of Contract Academic Staff (CAS). Here at the University of Calgary, these academic staff members are most commonly referred to as sessionals. The survey is open to those sessional academics who taught in the 2016-2017 academic year, at one or more Canadian post-secondary institutions. The survey consists of approximately 60 questions—some multiple-choice and some open-ended—that should take approximately 30 minutes to complete. The deadline to complete the survey is November 1, 2017. While participation is entirely voluntary, the Faculty Association is asking for our members’ participation to ensure as many sessionals as possible are included in this study. The start of this academic year again drew attention to the precarious position of many contract academics; the academics we call sessionals at the University of Calgary. In Canada there was a rebroadcast of Ira Basen’s CBC Radio documentary (originally aired on Sept. 7, 2014) about the “dirty little secret” of Canada’s universities: that an army of highly qualified and poorly paid instructors with no job security or pension are teaching about half of Canadian undergraduates. Beyond that rebroadcast, Canada and the US produced a flurry of tweets in the Twittersphere, drawing attention to the plight of many contract academic staff: getting contracts at the last minute and frantically trying to prepare adequately; sessionals’ assigned courses being cancelled at the last minute; the large number of courses contract academics teach at more than one institution to be able to eke out a minimal existence. The working conditions of contract academic staff are of national and international concern. The Canadian Association of University Teachers (CAUT) has decided to focus its efforts on Fair Employment Day, October 7, to provide a more concentrated effect and to align with fair employment for all precarious workers. By doing this, CAUT and its member associations have joined a coalition of unions and activists across North America and around the world to organize a series of events during the International Labour Organization (ILO) World Day for Decent Work. This kind of coalition work is vital in an atmosphere of increasingly precarious working conditions in virtually all sectors. However, as academics we also have to keep in mind that one of the cornerstones vital to our work: academic freedom, is virtually impossible for someone who is afraid of not being rehired. And how do things look here at the University of Calgary? While the Faculty Association has been successful in the conversion of some long-time sessional instructors into instructor positions, as well as a sessional’s right of first refusal in applying for a further sessional appointment, the proportion of sessionals remains stubbornly constant. 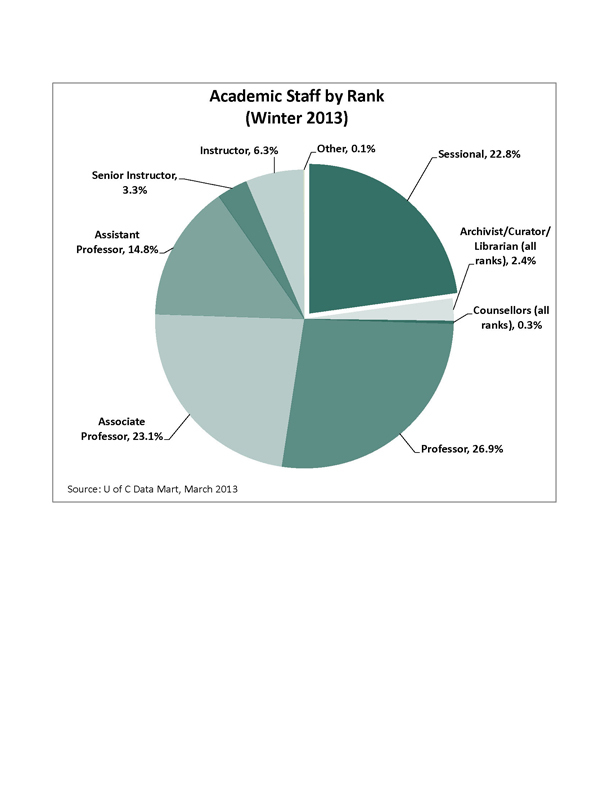 As you can see from the chart, “Academic Staff by Rank,” the percentage of sessionals remains at around 23 percent – the same as for associate professors, and the same percentage as last year and many years before. You can also see that some faculties make much higher use of contract academics than others: over 50% in one faculty and over 40% in three other faculties (“Academic Staff by Faculty”). While there is a need for some true sessionals – experts in their field who are employed elsewhere and provide expert knowledge to their classes – there remain too many Contract Academic Staff who are rehired year after year into positions that are clearly ongoing and should be filled as such. While I am pleased that the university is committed to hiring 100 new faculty members into tenure track positions over the next 2 years, I have concerns that these new hires will further consign many of our members to the “Sessional Ghetto.” However, I remain hopeful that that our senior administration will do the right thing and at the very least hire some long-term sessionals, who have proven their worth to the university over the course of multiple contracts, into some of those positions. I encourage our members who are concerned about the two tiered-system: Regular Academic Staff with support for all aspects of their work, ongoing contracts and academic freedom versus Contract Academic Staff with no job security, little institutional support and no academic freedom – to take action by signing the CAUT Pledge of Solidarity. This year, in conjunction with Fair Employment Day, the Faculty Association is continuing to award Sessional Travel Grants to provide these members with an opportunity to profile their research (work some continue to do even though they may not be compensated for it) or attend conferences to remain current in their fields. Three grants are available to be awarded (more information and application information is available online here). We would like to congratulate 2014 Sessional Travel Grant recipients: Susanne Cote (Anthropology and Archaeology, Faculty of Arts), Christine Mains (Communication, Media and Film, Faculty of Arts), Amber Porter (Classics and Religion, Faculty of Arts) and Kris Vasudevan (Mathematics and Statistics, Faculty of Science). In recognition of the contributions of sessionals to the academic environment the Association is awarding Sessional Travel Grants. Three grants of up to $2,000 each are available. The deadline for application is December 14, 2015. Sessional applicants must have completed at least three (3) half-course equivalents at the University of Calgary between September 1, 2014 and December 31, 2015. Applicants must also be contracted at the University of Calgary for the Fall 2015 and/or Winter 2016 semesters. Travel must be completed by December 31, 2016. Imagine, as an experienced academic, having to reapply for your job every year – or possibly every semester; and possibly even knowing the program you teach in would collapse without the teaching you provide. Many of our colleagues at U of C experience this reality, year after year. These contract academic staff members we call sessional instructors, are hired by U of C to teach individual courses; they are not expected to do research and they are not offered long- or short- term commitments beyond the individual courses. These academics often work for low pay, and with the uncertainty of whether or not another short-term contract will be extended to them. In some faculties, sessionals make up roughly half of the academic staff. That means half of the faculty members do not have job security or a reasonable salary with benefits. Many do not have a private office in which to meet students or a say in the academic and other decisions made in the academic unit. And last, but far from least, because of the nature of their positions, they would not have true academic freedom, one of the cornerstones of the academic profession. What do things look like at the University of Calgary? You can see from the chart (Academic Staff by Rank) that about 23% of the academic staff are sessionals – roughly the same percentage as Associate Professors; and these numbers have remained steady since at least 2011. These highly qualified and dedicated individuals care deeply for their students and the University, yet they tend to be treated poorly and receive much less support than ongoing faculty members to do their work. As contract academic staff often teach large classes, the number of students they teach is significant and their poor working conditions can affect learning conditions for their students. There are other direct impacts that we all feel. As one example, there are fewer people who can take on the numerous service elements of the academic job; fewer continuing faculty means heavier service responsibilities. It also means not being able to take advantage of the experience and expertise of colleagues who would have much more to offer their academic units if they were incorporated into decision-making processes. The working conditions of contract academic staff are of both local and national concern, which is why the Canadian Association of University Teachers (CAUT) annually promotes and plays a coordinating role in Fair Employment Week (FEW). FEW (this year’s incarnation runs from October 27th to 31st) is a national event that raises awareness of the difficulties inherent in being a member of the contract academic staff. Contract academic staff are often on the front lines of attacks on academic freedom, quality, fair treatment, and the value of research. To recognize the work and contributions of our sessional instructors, the Faculty Association introduced a program of Sessional Travel Grants in conjunction with FEW in 2012. The purpose of these grants is to provide these members with an opportunity to profile their research (work some continue to do even though they may not be compensated for it) or attend conferences to remain current in their fields. Three grants are available to be awarded (more information and application forms are available here). Last year, the Association awarded three grants. We would like to congratulate the FEW 2013 grant recipients: Sarah Eaton (Werklund School of Education), Valerie Pruegger (Department of Psychology, Faculty of Arts) and Owen Slater (Department of Ecosystem and Public Health, Faculty of Veterinary Medicine). While the Faculty Association is pleased to support these sessionals in their academic endeavors through this program, this is really a drop in the bucket. Ultimately it is up to universities to better support the academic work of their contract academic staff. The Association has made a number of gains, including the conversion of some long-time sessional instructors into instructor positions, as well as a sessional’s right of first refusal in applying for a further sessional appointment. We know this is just the tip of the iceberg, so we will continue to look into this and try to make more progress. While these small changes ease the working conditions of many long-serving contract academics, the University’s reliance on sessionals as a cheap and flexible workforce remains problematic. I encourage all continuing academic staff to let your colleagues and administrators know that the unfair treatment of sessionals at the U of C needs to be resolved. In recognition of the contributions of sessionals to the academic environment the Association is awarding Sessional Travel Grants. Three grants of up to $2,000 each are available. The deadline for application is December 15, 2014. Sessional applicants must have completed at least three (3) half-course equivalents at the University of Calgary between September 1, 2013 and December 31, 2014. Applicants must also be contracted at the University of Calgary for the Fall 2014 and/or Winter 2015 semesters. Travel must be completed by December 31, 2015. Grant recipients will be selected by the Faculty Association based on the quality of their application and the relevance of the conference to the research/field of study. Sessionals making scholarly presentations will normally be given priority. Last year, for the first time, the Faculty Association offered Sessional Travel Grants as part of Fair Employment Week (FEW). The response to the grant program was tremendous and the Association has decided to offer them again this year as part of FEW 2013. The purpose of these grants is to provide sessional academics with an opportunity to profile their research (work some continue to do even though they may not be compensated for it) or attend conferences to remain current in their fields. For those that may not know, FEW (running this year from October 21st to 25th) is a national event that raises awareness of the difficulties inherent in being a member of the contract academic staff (at the U of C these staff are also known as sessionals). Contract academic staff are often on the front lines of attacks on academic freedom, quality, fair treatment, and the value of research. Universities continue to lean on contract academic staff as an inexpensive, flexible workforce. At the U of C sessional instructors are typically hired to teach individual courses; they are not expected to do research and they are not offered long-term or even medium-term commitments beyond the individual courses. These academics often work for low pay, and with the uncertainty of whether or not another short-term contract will be extended to them. The numbers of academics in these positions continues to grow both nationally and internationally. This growth is of significant concern to the Canadian Association of University Teachers (CAUT), which is why CAUT annually plays a coordinating role in FEW. CAUT has recently launched a new website supporting FEW: www.fairemploymentweek.ca. Here at the U of C, like campuses elsewhere, the working conditions of sessionals directly impact the learning conditions of the students they teach. Through offering this travel grant program the Association is hoping to provide opportunities for sessional academics they would not otherwise have. Three grants are again available to be awarded (eligibility criteria and deadlines for application are available here) and information has been sent to all sessional members. Based on the applications, the Association decided to award four grants last year. We would like to congratulate the FEW 2012 grant recipients: Marie Farrell (Faculty of Education), Brad Mahon (Department of Music), Christine Mains (Department of Communication and Culture), and Derrick Nault (Department of History). Grant recipients traveled broadly, attending events in Canada, in the U.S. and internationally, engaging in work that impacts their research and teaching. One of the Sessional Travel Grant recipients reported to the Association that, as a sessional instructor, having the opportunity to attend the conference meant being able to experience a broad range of thought-provoking research and conversations that she will bring back to her work with students. 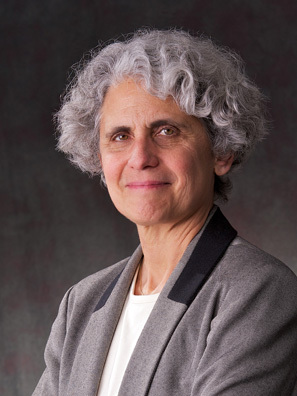 She noted that being able to integrate the thinking and perspectives of researchers in her field into her work at the University of Calgary, will help her provide a richer educational experience for the students entrusted to her. Another recipient reported that the conference provided the kind of opportunity to build a career that those on the tenure track often take for granted, and those who piece together careers out of sessional contracts can only wistfully imagine. The Faculty Association is pleased to help these sessionals with their academic endeavors through this program. But ultimately it is up to universities to better support their contract academic staff. The Association was pleased, through the recent ratification of the Collective Agreement, to convert a number of long-serving, full-time sessionals to ongoing appointments. While this covered the most egregious cases, the Association would like to see more job security for other long-time sessionals. In March 2013 the Association took a snapshot of its membership which revealed that 22.8% of academic staff at the U of C at that time held sessional positions. 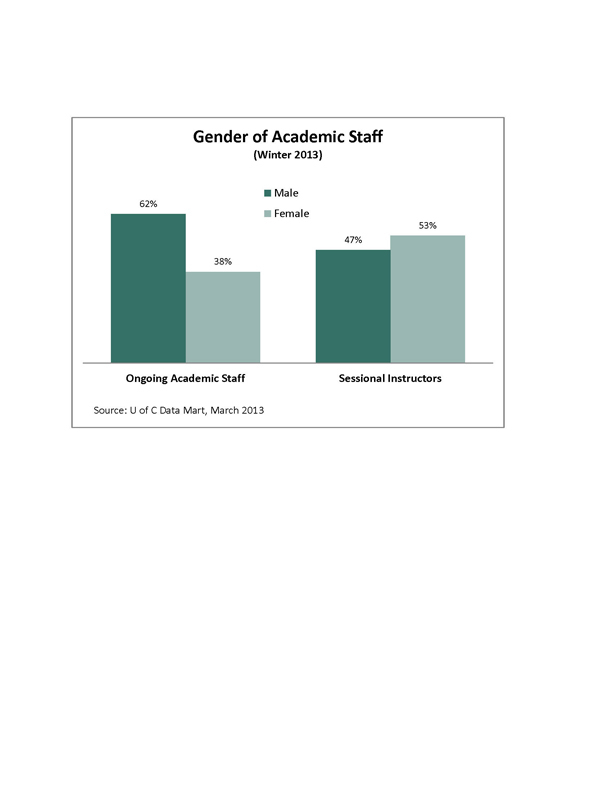 Not much has changed over the past year regarding the statistics on the faculty and gender of sessionals. You will find that the number of sessional academic appointments are almost equal to the number of Associate Professors, and they are employed in every corner of the University. In addition, over half of sessionals are female which is in contrast to statistics for ongoing academics. It is important to emphasize the incredible dedication of these individuals to their jobs since sessionals are highly-qualified individuals who care deeply for the University and their students. The Association has always recognized that the concerns of contract academic staff should be the concerns of us all. Please let your colleagues and administrators know that the unfair treatment of sessionals at the U of C needs to be resolved. In recognition of the contributions of sessionals to the academic environment the Association is awarding Sessional Travel Grants. Three grants of up to $1,800 each are available. Sessional applicants must have completed at least three (3) half-course equivalents at the University of Calgary between September 1, 2012 and December 31, 2013. Applicants must also be contracted at the University of Calgary for the Fall 2013 and/or Winter 2014 semesters. Travel must be completed by August 31, 2014.